If you are going through a divorce or are still having legal problems with your ex-spouse after a divorce, we want you to keep something in mind…you have rights, and we’re there to defend you. At the TATE BYWATER law firm, we understand that every relationship is different, and therefore no two relationships end in the same way. That’s why it’s important to open the lines of communication as much as possible to make sure that everyone is being heard. We’ll talk with you: We understand that you’re going through a difficult time, and we’ll treat you with the utmost respect. You should know that we’ll be asking some difficult questions that might touch on sore subjects, and we’ll need to get concise answers from you so that we can help you to the absolute maximum degree. We’ll respect your family: Two people getting divorced is a relatively simple affair, legally speaking. But as soon as you add children to the mix or a complex marital estate, the complications that arise compound tenfold. Again, it’s important to remember that we need to know what your goals are so that we can do what’s best for you, your ex, and especially for the children. We’ll defend your rights: When it comes to messy divorces, especially those involving custody of children, emotions can cause things to get ugly. When this happens one party might hire an attorney who will try underhanded tactics. We’ve seen this before, we’re ready for it, and we’re ready to defend your rights even if it means taking your case to trial. When we have a clear picture of what you’re looking for, it will be much easier for us to help you get what you want legally. 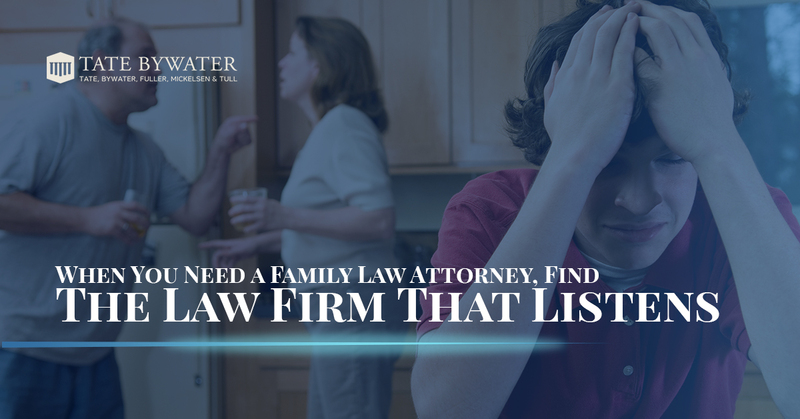 The best way to do that is for us to talk, so please give the law firm of TATE BYWATER a call when you need a family law attorney to ensure that your rights are upheld.